Coats, gloves, scarfs, oh my! How often do we just throw in purses, gloves, scarfs, bags into our coat closet? What if you bent over to get something off the floor on a daily basis? How quickly would your back get sore? My client was at that point. She was sick and tired of bending over to get the purse of the day off the floor. How often do you throw in your gloves and as much as you try, you put them into a wire basket -- at least they are "together"? But are they? My client was sick and tired of opening the doors to her coat closet and feeling overwhelmed, anxious to get out the door, and to visually see what her life must be on the inside. I asked questions and listened...to learn about out her goals, what was working (which is extremely important), what wasn't working, and where she wanted the miscellaneous items homes to be. It was very crucial that she shared that her husband and her things are on separate sides of the closet. Could you imagine if this wasn't discussed and I re-organized the coats by season combining the two?! Client interaction and client's dynamics are very crucial in a successful organization. 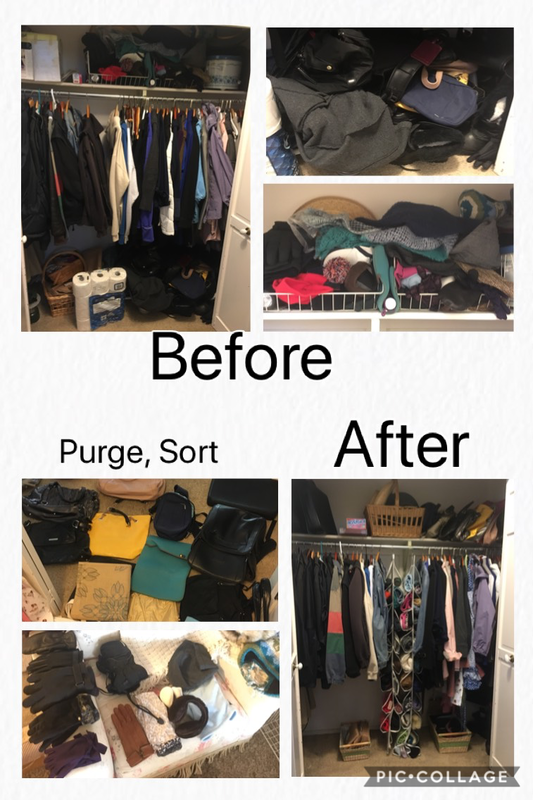 Following the same steps as with any organizing project, purging -- taking everything out of the closet -- and sorting into categories is essential. Laying the items out to see how many or how much in quantity they had of the various categories, such as hats, gloves, purses, allows you to access what containers are needed. Realizing the wire baskets on the top shelf of the closet wasn't efficient, and caused the question "where's my other glove?" to be asked one too many times, I found a container that was used to hold shoes. It was very clear that there was a better purpose for this container - as it not only keeps the gloves together, but also helps from reaching up and everything just thrown together. When my client walks by her closet which is in the middle of her home -- so she walks by it many, many times throughout the day -- she can smile. She can feel empowered, living a simpler life with less chaos or anxiety when she needs to open the doors and find something.